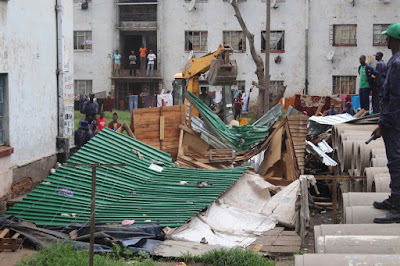 Harare mayor Herbert Gomba has directed that all on-going demolitions against vendors’ infrastructure be stopped and urged hawkers to approach council for new trading sites. This comes in the wake of the crackdown on illegal vending by the army, the Zimbabwe Republic Police and municipal police officers in some parts of Harare. Addressing a Press conference yesterday, Gomba said council was against forced evictions of vendors, but at the same time did not tolerate illegality. “All members of the informal sector who have been trading at undesignated points and were removed from the illegal sites are advised to visit their nearest district offices for space allocations. Taking up space at approved trading sites will eliminate the demolition of illegal structures and loss of investments,” Gomba said. Council has identified new trading sites in Mbare at Tsiga, Marowa and Stodart Hall and at Mutare Bus Rank. In the city centre, the new trading sites would be at the Coca-Cola open space and the holding bay along Coventry Road. Last week, members of the military, together with police, razed down market stalls across the city, with many vendors losing their investments. “We want people to be relocated to the designated trading sites without force. We don’t subscribe to this notion of demolition before allocation of an alternative place. So we want to deal with this issue,” Gomba said.